Some people don't like large manuals and just want to take this thing for a ride but don't know where to start. The last part is applicable for users that have been using a pre-Reason 6 version and never touched Record. However, I would like to address that Reason does come with a PDF Manual. Yet, some may still not know where to start or what choices to make and such. Therefor I am writing down my own step by step guide to make your journey in Reason 6.5 a bit easier. Every screen segment can be sub divided in to smaller segments. To learn these things one should really dig into the operation manual or watch some video tutorials on how people use the program. The main problem with a DAW as this, there is no “given” work-flow. Just ask a few Reason users the same question, and you will most likely get a difference answer in return. At the same time this is also the beauty behind a program like this. For those who are new to the Reason Rack, or people who are used to other digital work station, the Rack is probably something to figure out in the long run. However, in the short run, the Reason Rack is not really that hard to understand. Think of it as being a virtual Rack where you would normally stack devices into. This large rack will eventually have all sorts of loose end components in it, but can also interact with each other when needed. The Subtractor, use this device to create anolog synthesizer gear for instance. The NN-XT advanced sampler is similar as the NN-19, but gets more complex when you want to layer multiple WAV files. Initially, loading patches from the factory sound bank or Refills is probably the way to go in the early days. The Redrum is a sample player for playing Drum samples. It is an easy to use tool, yet some may find it hard to use the patterns. We will get back to that one pretty soon. Kong is a Designer thing. If Sound Design is not your thing, you can still browse Kong patches and have a go with it. If sound design is your cup of tea you may find Kong a cool toy to play with. Kong is especially handy when you use an MPC Drum Keyboard. Dr Octo Rex is a tool to play mostly backing tracks fast! From a beginning point of view people will most definitely find playing with a Octo Rex fun, but at some point limited. However the Octorex can also be versatile when you get the idea behind slicing and such. The instruments basically sum Reason up in a nut shell when it comes down to producing sounds. And from my personal point of view: it should be enough when you get started. Even for a beginner your brain might already start to explode when reading this. But if you would compare it with other DAWs, other DAWs usually have more plugins to choose from to create sounds. It totally depends on what your flavor is. If you are a synthesizer wizard then you would probably start fiddling around with Envelopes and filters on the Subtractor, Malstrom or Thor. If you are more in to sampling and using Wav Files, then the NN-XT, NN-19 and Kong is probably going to be more your cup of tea. What a lot of people will probably think at the point they load up a DAW is the first thought that comes to mind “I want to make a track that sounds like … “fill in some fat DJ that just produced the most uber dub-step track that everyone wants to play”. This is probably not the way to start... WITH ANY DAW! One must understand the force first before one wants to use it. So lets start with that basic concept. With each device you want to master, you might find a “load preset” button or “load sample” button. Browsing patches will most likely help you with learning what certain settings do with certain sounds. You may find certain sounds in the factory sound bank which you may like. Remember those, or write them down on a piece of paper so you can find them back again. This is all part of the process “learning the DAW”. Next step we'll take is the Sequencer window. It may be early in the process. But without a sequence you are not getting that far. In a nut shell, the instrument you choose in the Rack, can be played in the Sequencer. All the note information is being translated to the rack devices, and all that information combined produces: Music! Yeah, it is in fact that simple. In the sequencer there is at this stage one thing you need to know: Every instrument you create in the Rack, you will also create a Sequencer Lane in the sequencer itself. So for instance, we create an NN-XT in the Rack, you will see that there is an NN-XT lane on the sequencer. These functions can be toggled by using the basic keyboard buttons: QWERTY and are the basic functions to draw in a sequence. In most cases you might want to use just the selecting tool, either pencil tool. Erasing, slicing, muting etc will be tools for later stages when the sequence gets more complex. - Select the pencil tool, draw a bar on the sequencer. The bottom line behind the sequencer of Reason, there are different modes. In the initial stage you have the “song mode”. This mode shows all the building blocks on how the sequence is arranged. By double clicking on a bar in the song mode, you will enter the “edit mode”. This mode allows you to “zoom in” on a specific portion of the sequencer. Thus you see information such as notes, velocity and (eventually) automation information. While creating a song you will find out that you will most likely have to jump back and forth from Edit mode to Song mode to create a full arrangement. Another way to look at this is using building blocks. In a way you create your first building block in the song mode, you zoom in, and you define that specific building block on what notes are played. You start creating different types of these smaller blocks and them in a specific order (thus it becomes a sequence of building blocks). The block mode is a special mode that creates larger building blocks. In this article I won't be getting into the “Blocks” mode. In the edit mode you will normally find a keyboard lane on the left side (with the exception of the Redrum, OctoRex and Matrix Pattern Step Sequencer). The keyboard lane is like a virtual piano and present all the different keys for reference. This might aid you for laying in your notes while drawing them in with the pencil tool. If you have a midi keyboard you can record the notes while pressing the “record button”. You will notice that keys are triggered that correspond with the keyboard lane. - set the audio equipment up. 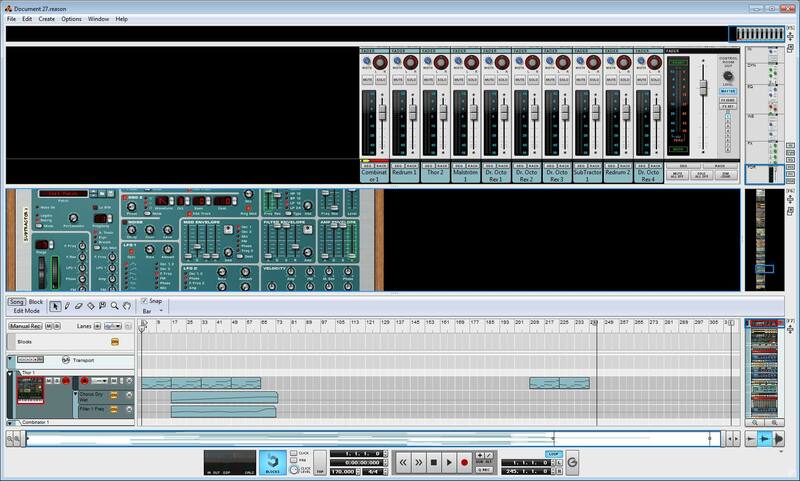 The beauty behind the sequencer is that it works in a similar way your can change note sequences. There is one difference here. While the note sequencers can use multiple note lanes, you can record different comp edits to record multiple takes. In this case you can swap back and forth from tracks by using mute buttons (in this case the mute tool comes in handy).